Thermoplastic starch-based composites generate worldwide interest as they are based on green raw materials and undergo complete degradation. The composites were first fabricated from starch and sisal fibers as the major materials via the forming process. The effect of starches with different contents of single- and multicomponent plasticizers on the cushioning properties of the composites was studied. An increase in plasticizer contents within a certain range is shown to enhance materials resistance to pressure and its cushioning performance. 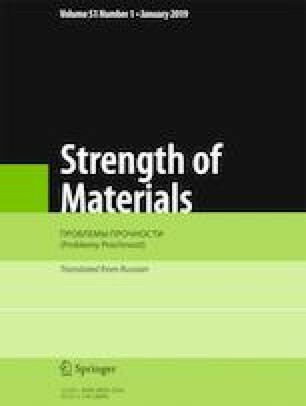 With the multicomponent plasticizer content of 15%, the resistance to pressure for four types of composites prepared at different weight ratios of formamide and urea were of the order of 2:1 > 1:1 > 1:2, and that of the four types of composites fabricated at different weight ratios of glycerol and ethylene glycol were of the order of 1:2 > 2:1 > 1:1. Multicomponent plasticizer-containing starch-based composites are shown to be irregular elastomers and the stress-strain relation to be first defined by a hyperbolic tangent curve function and then by the tangent one. Translated from Problemy Prochnosti, No. 1, pp. 24 – 31, January – February, 2019. The authors gratefully appreciate the financial support from the National Natural Science Foundation of China (Nos. 51775318, 51305239, and 51275278), and Natural Science Foundation of Shandong Provincial (Nos. ZR2013EEQ010 and 2014ZRB019XH). We also appreciate the assistance of our colleagues from Shandong University, China.